Many had marched, chanted, protested against the Pork Barrel Scam. In fact I myself is so much against these Pork Barrel idea... and the ultimate face of the Pork Barrel Scam is none other than Janet Lim Napoles. She has been the subject of hard and practical jokes on the social network. I am a tax payer too and I too is very upset and saddened on the idea that the tax the government siphoned on my hard earned salary was issued to ghost and questionable government projects. That tax I paid should have been used for my sisters education, food in my table, milk and coffee before going to bed and going to work, my monthly medicine or even a savings for future needs. I still pay my taxes not because I want to but because I have to; thinking that it will go to projects for the betterment of my country. However, to point the whole pork barrel scam to only one person is not a good sign. Now that Janet Napoles has come out and surrendered herself to authority, she should point those corrupt government officials to join her in her own cell. The politicians behind these Pork Barrel business may be are laughing and enjoying because the public is only focusing to their puppet. 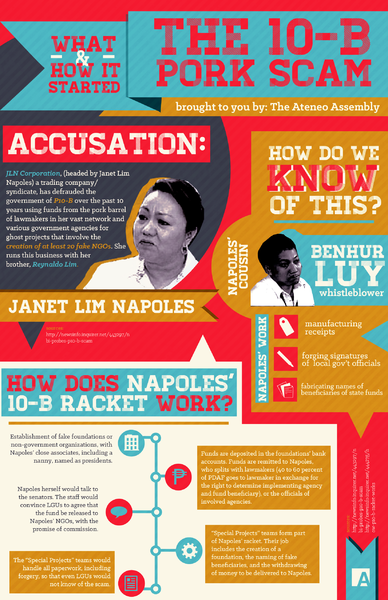 They may be are thinking go ahead persecute Janet Napoles anyway they can always get another one no matter what. Isn't it that before and after issuing the money for the said project. it should have been verified first? Why is this part of the process neglected? So it means, without the "whistle-blowers" the government has no way of accounting these projects? I wanted to share a joke I overheard in the jeepney last weekend: "Naku kaya lang naman kumanta ang whistle-blower dahil kulang and kanyang kinubra." For me, I am thankful because we have those Whistle Blowers but they (referring to people talking inside the jeepney) could be true too, so they need to be investigated as well. Because if they became accessory to the crime then they should be part of the case to be filed by Department of Justice. I hope that the President would listen to the cry of his people and totally abolish the idea of PORK BARREL. Remove the idea of giving a budget to his office, Senators and Congressman. The budget should go directly to the offices who are implementing projects and the executive branch of the government would only focus on their specific function. I hope that the President should go againts these Senators and Congressmans behind the PORK Barrel Scam. It is not acceptable that they dont know if the agencies are bogus, scam or not. It is for me a form of stupidity giving away millions of pesos without proper verification. Not unless of course IF they are part of the said business deals. 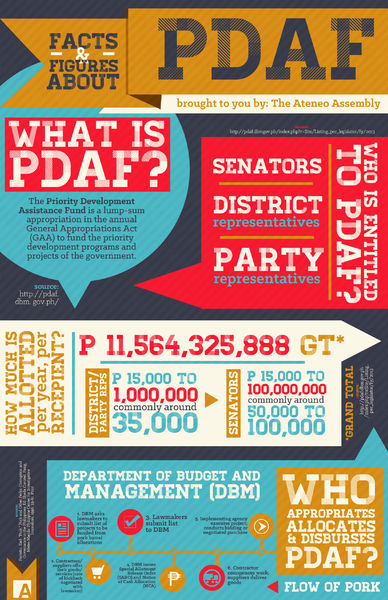 Last August 17 news broke about DILG budget allocation. Why spending too much on these housing for informal settlers? I am sorry but I think the "Baby Sitting" idea is simply too much and I also don't know what is that potable water for... is it for the general consumption of every tax payer? For me there is only one learning I am seeing on all these happenings. This is for the government to have a fair disclosure policy of some sort where they will announce all their earnings and expenses every quarter and one on its year end. These is in a form of either a webcast, TV coverage for their reporting. Because the public has the every right to know where there taxes are going. Barangay officials up to the President should provide a report every quarter and progress that is either televised for the media to ask question on behalf of every Filipinos. An accessible website where everybody could see the report should also be available. For me, these is very much necessary if we are that serious to eradicate contemptuous tax grabbing. The taxpayers pays their taxes no matter what. They pay their taxes even though they need every centavo of their salaries so they have all the right to know where the taxes are going, every centavos of spent for every project. In a normal human scenario.... If I am a government official and gives a million peso to an organization I would demand a detailed explanation and supporting documents to the said organization as to how the money was spent plus I would of course validate the information given to me. It is understandable for a government official to do so because they need to provide explanation as well to the public how the money/tax has been used. If we persecute Napoles it is imperative to persecute the government officials as well because Napoles will not have the urge to do such a multi-million scam if the government officials are of course responsible enough with their responsibility to their constituents.